This week I had my first repeat interview with an author for New Books in Historical Fiction. Besides marking a milestone for the podcast channel itself, the interview gave me some interesting insight into the broader themes that can animate an individual writer’s work. Virginia Pye’s first book, River of Dust, which we discussed in September 2013, focused on the tragedy of parents who lose their only child to abduction. But that novel—like her Dreams of the Red Phoenix, released just this week—also explores the complex mix of awareness and misunderstanding that affects people living far from home, in a culture they believe they know but in which they remain forever strangers, separated from those around them by assumptions so deeply held that neither side questions them. Some of these assumptions come perilously close to prejudices, but Pye’s characters are, for the most part, well-meaning people, their errors the result more of natural arrogance or a failure of imagination than of malicious intent. 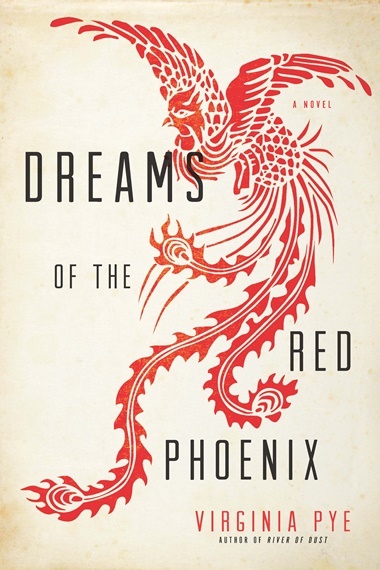 Like River of Dust, Dreams of the Red Phoenix is set in northwestern China among a community of missionaries from the United States. The Reverend Caleb Carson is in fact the nephew of John Wesley Watson, the minister in the first book. (The two stories are, however, completely independent—not part of a series.) Twenty-seven years have passed, and expectations have changed. Yet the smoke and mirrors remain, obscuring both sides of the cultural exchange even as war and revolution threaten to complete the destruction wrought by the perennial dangers of drought and hunger. Of the brutal conflicts that characterized the twentieth century, none equaled in scale the catastrophe that struck China when the Japanese occupied the northern part of the country just as the Civil War was picking up steam. According to some estimates, 22.5 million people died in these twin acts of destruction. Dreams of the Red Phoenix (Unbridled Books, 2015) takes place during a few weeks in the summer of 1937, as seen from the perspective of North American missionaries who only think they understand the local culture and their place in it. Sheila Carson—mourning the recent death of her husband, the Reverend Caleb—can hardly bring herself to get up in the morning, let alone supervise work around her house or rein in her teenaged son, Charles, who soon causes trouble for himself and his mother by taunting the Japanese soldiers who patrol the area. But when attacks on the civilian population send a stream of wounded and hungry people into the mission looking for aid, Shirley, one of the few trained nurses in the compound, is pulled into service, her house turned into a clinic. The mission’s protected status, based on U.S. neutrality in these years before World War II, falls under threat when the Japanese army suspects that the refugees include Nationalist and Communist soldiers, and Shirley must decide whether to leave with her fellow Americans or stay and help the charismatic Communist general whose philosophy appeals to her idealistic nature. Her memories of her husband, her responsibilities as a mother, and her own sense of right and purpose are pushing Shirley in different directions even before outside forces intervene to complicate her path. As in her earlier novel, River of Dust, Virginia Pye here takes stories of her own ancestors—in this case, her grandmother and family friends—and weaves them into a vivid, evocative tapestry of love and loss, belonging and alienation, deception and truth.